This is a basic short car for your Narrow Gauge logging operation. 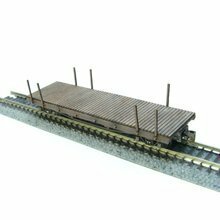 It has rails for use with a Barnhardt Log Loader. This kit requires Z Scale trucks to be purchased separately. (The photo shows MTL #955 trucks with short couplers). This kit is the most simple to build and requires only trucks to complete but it can be painted and weathered to bring out the detail and full potential of a much more complicated model. 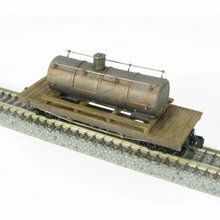 Weathered wood, rusty rail and a bit of chain brings this kit to life and will be right at home on any logging layout or diorama. I’m sure I’ll be buying a few more of these gems! Thanks again to the fine folks at Showcase Miniatures for not only another great model but also for the great service and speedy delivery.